Permanent Vacation is the ninth studio album by American rock band Aerosmith, released in 1987. The album marks a turning point in the band career. It is their first album to employ professional songwriters, instead of featuring material solely composed by members of the band. It was also the first Aerosmith album to be promoted by heavy music video airplay on MTV. 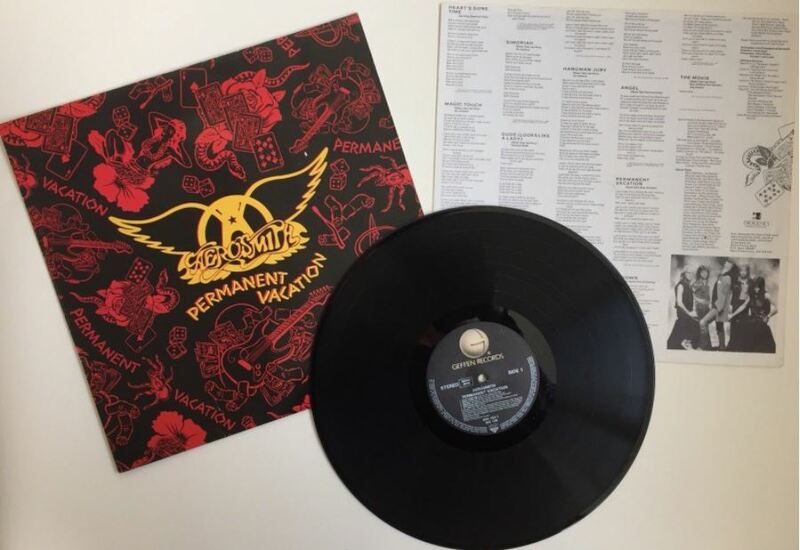 Though Done with Mirrors was intended to mark Aerosmith comeback, Permanent Vacation is often considered their true comeback album, as it was the band first truly popular album since their reunion. “”Rag Doll”” “”Dude (Looks Like a Lady)”” and “”Angel”” all became major hit singles (all three songs charted in the Top 20) and helped Permanent Vacation become the band most successful album in a decade. The album features their cover of “”I’m Down””, a piano-driven Beatles song that appeared as a b-side to their single “”Help”” in 1965. This was Aerosmith second commercially-released Beatles cover, after “”Come Together””. Permanent Vacation has sold over five million copies in the U.S. In the UK, it was the first Aerosmith album to attain both Silver (60,000 units sold) and Gold (100,000 units sold) certification by the British Phonographic Industry, achieving these in July 1989 and March 1990 respectively. Permanent Vacation was the resurrection of Aerosmith: a legendary band of the ‘70s reborn in the ‘80s. Their comeback was achieved by bringing in hit songwriters from outside of the band to bring the music in line with contemporary arena rock. Two US top 20 singles, Dude (Looks Like A Lady) and Angel, were co-written with Desmond Child; a third, Rag Doll, was written with Holly Knight. But there was one song on the album that was credited to the five band members and nobody else. And it’s the weirdest thing they’ve ever recorded. here is a lesser-known classic – one of the 10 best deep cuts by this legendary band: The Movie is essentially an instrumental jam, built around a heavy, hypnotic riff. The one voice that is heard is not Steven Tyler’s – instead, it’s a woman speaking in an arcane language, reported to be Gaelic. What it proved is that Aerosmith didn’t need drugs to get totally out there. SKU: YP-7910 Categories: All Genres, Hard Rock, Search by Media Type, Vinyl, 12 "